BREDEKAMP, HORST. 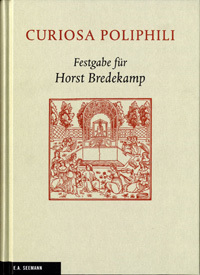 Curiosa Poliphili. Festgabe für Horst Bredekamp. Hrsg. von Nicole Hegener, Claudia Lichte & Bettina Marten. 256 S. mit 100 Abb., Ppbd. The confusion and inaccuracies began in 1914 with the three-volume edition of Vincent van Gogh’s letters to his brother Theo published by Johanna van Gogh-Bongers.4 A detailed biography of the van Gogh family, particularly Vincent’s tragic personal circumstances, serves as a preamble to the publication. In large measure the preamble is unreliable and not always able to stand up to scientific criteria, but it remains to the present day the foundation for many other van Gogh biographies. These, however, are not immune to the accusation that they suffer a certain collective blindness, even if the truth behind the biographical sketch of this family member is neither questioned nor examined and regarded as authentic. In her honorable efforts to smooth out the family history Johanna van Gogh-Bonger was demonstrably unable to resist the temptation to either disregard, re-interpret or play down some events.5 Her portrayal of the ear incident reads as follows and I quote: “In a moment of extreme agitation – “un accès de fièvre chaude,” as Vincent later calls it himself – Vincent cut off a piece of one ear and gave it to one of the girls at the whorehouse.”6 Initially, this statement remained undisputed. Whereas the biographic descriptions of Johanna van Gogh-Bonger and Gustave Coquiot are to a large extent anecdotic in character, this source material serves as a valuable addition to the entire scope of Vincent van Gogh’s correspondence which survives through today and is the creed upon which countless van Gogh biographies have been based up through the present day. A study carried out by Victor Doiteau and Edgar Leroy, published in 1928, in no way provided an answer to the problem.9 The publication contained all of the handwritten reports in Vincent van Gogh’s medical record by the doctors who treated him. These records very carefully document Vincent van Gogh’s case history, weekly and monthly clinical records, as well as a discharge certificate. These records provide clear evidence. Among other things, all three attending physicians diagnose that van Gogh cut off his left ear during a severe seizure. In the preamble to the publication, the attached facsimiles of which unequivocally verify the evidence that the injury involved the entire ear, the team of authors express its warm-hearted thanks to Johanna van Gogh-Bonger for her cooperation. Hence, in the description of what happened on 23 December 1888, the statements of the three attending physicians are arbitrarily corrected by the authors Doiteau and Leroy, stating that it was only an earlobe: “Voici ce qui s’était passé. [sic!] Van Gogh rentre à la maison et immédiatement se coupa l’oreille juste au ras de la tête. (Vincent se mutila moins grièvement que le dit Gauguin, il s’entailla seulement le lobute de l’oreille gauche.) Il dut metre un certain temps à arreter le sang […].”10 Although both authors are doctors of medicine no explanation is given as to how they have gained certainty on this issue. One cannot help thinking that the parenthetical sentence, and its far-reaching consequences, was included after having consulted Johanna van Gogh-Bonger. Ronald Pickvance follows Johanna’s version in a comprehensive study of the time Vincent spent in Arles. Following a newspaper article published in Forum Républicain on 30 December 1888, Ronald Pickvance’s description of that fateful night reads as follows: “After a violent quarrel with Gauguin (who had decided to spend the night in a hotel) van Gogh appeared at 11:30 P.M. at the maison de tolerance No. 1, asked to see a girl named Rachel and handed her his ear with these words: ‘Take good care of this object.’ Then he disappeared (Le Forum Républicain, 30 December 1888; in fact, van Gogh did not cut off the whole of his ear, but only the lower part.) After presenting it to Rachel, he returned to his house and went to bed.”11 The author does not disclose what source leads him to alter the report in Forum Républicain – based on the prostitute’s testimony – to the effect that an earlobe was in fact concerned. In years to come he reiterates this statement, repeating it one last time in his autobiography from 1903, completed just shortly before his death: “Il coupa l’oreille au ras de la tête.”15 Emile Bernard, who attended Vincent van Gogh’s funeral on 30 July 1890 and could have checked this evidence at the latest by this time, confimed in 1911: “In an unfathomable seizure Vincent cut off an ear giving it to a friend in a whorehouse. […] They forced open the door the next morning. By then, the great loss of blood had caused him to lose consciousness.”16 On that fateful night in Arles, the prostitutes called in Alphonse Robert, the police officer on duty in their neighborhood that evening: “Back then, in 1888, I was a security guard. I was on duty in the red-light district that particular day. When I walked past brothel No. 1, […] I’ve forgotten the name of the prostitute […] in the presence of her mistress the latter gave me the newspaper in which the ear was wrapped up […] I checked what was in the package and verified that it was an entire ear.”17 A press release from Arles in the weekly newspaper Forum Républicain dated 30 December 1888 is based on the statements of the prostitute and the policeman: “Last Sunday, at about 11:30 P.M., a certain Vincent Vangogh [sic! ], artist, born in Holland, appeared at whorehouse No. 1, asked to see a certain Rachel and gave her his ear with the words: ‘Take good care of this object.’ Then he disappeared. Notified of this incident, which could only have been the action of a poor madman, the police went to the house of the aforementioned person the next morning and found him lying in bed; he was hardly showing any sign of life. The poor fellow was taken as an emergency to hospital right away.”18 Once he had recovered temporarily Vincent van Gogh paid a visit to the prostitute the following month and apologized for the gift and the shock it had caused. There are also contemporary witnesses in Auvers whose honest statements serve to establish the truth. Adeline Ravoux, the daughter of the innkeeper, recalls: “I was still very young when Mr. Vincent came to us. He walked with his head inclined slightly to the side from which his missing ear was cleanly cut off.”24 Tony Hirschig, a fellow lodger of Vincent van Gogh’s at the Ravoux Inn testified: “I still see him in front of me, his ear severed […].”25 Paul Gachet alias Paul van Ryssel, physician and amateur painter, treated Vincent van Gogh during the few weeks he spent in Auvers from 20 May 1890 until his death on 29 July 1890. With the exception of a charcoal drawing of Vincent van Gogh on his deathbed, which served as a model for an etching and oil painting, both completed the same year, no other documents concerning Vincent van Gogh’s illness in the physician’s estate survive. The illustrations by the hobby painter do however give a hint of the degree of ear injury. As a photograph from Vincent’s youth and later self-portraits reveal, he had large, rounded, voluminous auricles (outer part of the ear). Gachet’s etching depicts in the place where the left ear had been a small spiky triangle of the inner auricle minus the outer part of the ear; in the oil painting this reference is completely gone. Only a maroon spot indicates the scar of the wound. It can be said that with the exception of the sister-in-law Johanna van Gogh-Bonger, who had family-related reasons for playing down the injury, not a single witness speaks of a severed earlobe. On the contrary, the mutually independent statements by the principal witness Paul Gauguin, the prostitute who was given the ear, the gendarme who was on duty in the red-light district, the investigating police officer and the local newspaper report, accord with the evidence that the artist’s unfortunate “self-mutilation” involves the entire (left) ear. The existing handwritten and clearly worded medical reports by three different physicians, all of whom observed and treated Vincent van Gogh over an extended period of time in Arles as well as in Saint-Rémy ought to provide ultimate proof of the fact that the artist was missing an entire ear and not just an earlobe. 1 Koldehoff, Stefan, Van Gogh – Mythos und Wirklichkeit. Cologne, 2003: 206. 2 Dorn, Roland, Décoration. Diss Univ. Mainz, Hildesheim, 1990 (Studien zur Kunstgeschichte 45): “Van Gogh was found, after cutting off his ear, unconscious in the Yellow House […],” page 22; “[…] van Gogh lost control of himself, cut off part of his ear which he gave to a prostitute at around 11:30 P.M. The next morning, he is found unconscious in the Yellow House and taken to the hospital in Arles. The circumstances leading to this incident cannot exactly be reconstructed […],” page 527. 3 The investigation is part of the research in preparation for a book publication on Vincent van Gogh’s and Paul Gauguin’s artist community in Arles. 4 Van Gogh, Vincent, Brileven aan zijn broeder. Published by Jo van Gogh-Bonger. 3 vols. Amsterdam, 1914. 5 Hulsker, Jan, Vincent and Theo van Gogh. A Dual Biography. Ann Arbor, Michigan, 1990: page XIV, page 5. Ibid. 3, pages 125, 132. 6 Van Gogh, Vincent, Briefe an seinen Bruder. Published by Johanna van Gogh-Bonger. Berlin, 1928. Vol. 1, preamble: page XLII. 8 Ibid. 7: pages 191-192. 9 Doiteau, Victor/Leroy, Edgard, La Folie de Vincent van Gogh. Paris, 1928. 11 Pickvance, Ronald, Van Gogh in Arles. Exhibition catalogue. Metropolitan Museum of Art, New York, 1984: page 195. 13 Ibid. 12. Letter 574. 15 Gauguin, Paul, Vorher und Nachher. Translated 1920 by Erik-Ernst Schwabach. Cologne, 1998: page 29. 16 Erpel, Fritz (Publisher), Vincent van Gogh. Sämtliche Briefe. Bornheim-Merten, 1985. 6 vols. Vol. 6: page 155. 17 Ibid. 16: page 30. 18 Le Forum Républicain. 30 December 1888: page 3. Bibliothèque Municipale d’Arles, Espace van Gogh Médiathèque. 19 Van Gogh à Arles. Exhibition catalogue Fondation Vincent van Gogh – Arles, 2003. Facsimile: pages 63-65 (report). 21 Stokvis, Benno, Vincent van Gogh in Arles, Kunst und Künstler. Vol. 27, September 1929: pages 470-474. 24 Ibid. 16. Vol. 6: page 309. 25 Ibid. 16. Vol. 6: page 308.